The Welcome Reception is the first social gathering between all conference delegates and it will take place at the Venue Hotel. It will be a relaxing evening during which delegates will have the opportunity to talk to colleagues and peers, while enjoying local drinks and ample canapés. We will get together at the hotel lobby and depart for a short guided sightseeing tour of Rome on the bus. At the end of the tour we will proceed to a local restaurant where the conference dinner will take place. The restaurant serves excellent local dishes in a beautiful Italian setting. Desserts, local wines and drinks will harmoniously complete the menu. The event can definitely be considered as an opportunity to meet and get to know better fellow delegates in a different yet relaxed environment. Unfortunately due to low participation, the below excursions have been cancelled. Note: Excursions can be added to your order during registration on www.easyconferences.org, or at a later time by editing your order. 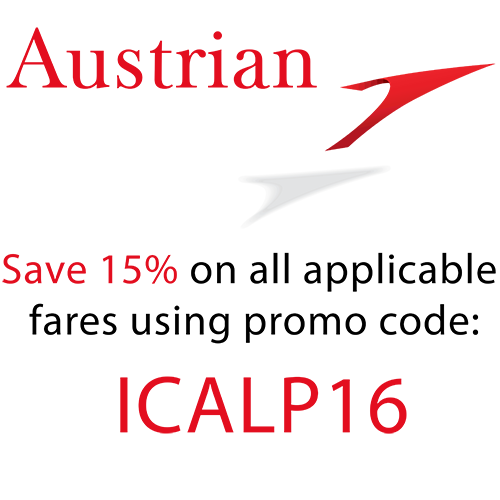 - The price includes: bus service, the assistance of a professional english speaking guide and entrance fees. We will begin with a Walk through the streets until we reach Piazza di Spagna. The area of Rome's downtown, characterized by three large roads – Via del Corso, Via di Ripetta and Via del Babuino – is called “Tridente”: in fact, these three roads start from Piazza del Popolo and open out fan-wise to the centre of the City. This area is a sort of “open – air museum”, thanks to an extraordinary concentration of works of art! Our walk begins in Piazza del Popolo, dominated by Il Tridente, an Egyptian obelisk, and by the church of S. Maria del Popolo, which contains wonderful paintings by Caravaggio, Annibale Carracci and Pinturicchio. Then, we will walk along Via di Ripetta and we will stop in Piazza Augusto Imperatore, where your guide will illustrate the history of the Mausoleum of the emperor Augustus and of the Ara Pacis, today located in the new museum designed by the architect Richard Meyer. We will proceed to the political centre of the City, i. e. Palazzo di Montecitorio, which is the seat of the Chamber of Deputies, and Palazzo Chigi, the official residence of the prime minister. From here, we will go to Via dei Condotti, the most elegant, luxury shopping street in town, where we will taste some good coffee in the ancient Caffè Greco, a historical meeting-place for artists and literati. 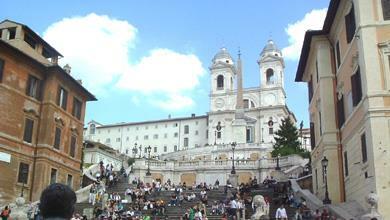 We will reach Piazza di Spagna, one of the most monumental urban scenographies in Roman Baroque architecture! We will admire the famous fountain called “Barcaccia” and we will walk up the Scalinata (Spanish Steps) that leads to the church of Trinità dei Monti; from here, you will enjoy one of the most fascinating views of the City. We will begin with a Walk through the streets until we reach Piazza Navona. By a pleasant walk, this itinerary will let you discover the most elegant squares of Rome, the “living rooms” of the City. The tour starts in Piazza Farnese, dominated by the magnificent Palazzo Farnese, a Renaissance building, started by Antonio da Sangallo, continued by Michelangelo and completed by Giacomo della Porta. Close to the square, where Palazzo Spadais located: here, we will admire Borromini’s perspective gallery, a jewel of Baroque art. Then, we will walk towards Campo de’ Fiori, which today houses a lively and characteristic market; once a site of executions (here the philosopher Giordano Bruno was sentenced to death for heresy), nowadays it is one of the most “young” plazas in Rome. 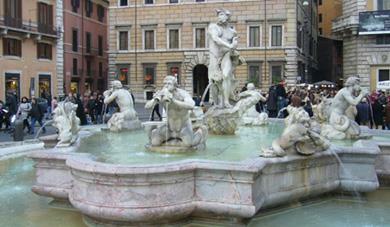 We will proceed to Piazza Navona, where the masterpieces of the two most representative artists of the Baroque period are located: the Fontana dei Quattro Fiumi (Fountain of the four Rivers) by Bernini, and the church of St. Agnese in Agone, by Borromini. We will end our visit at the Pantheon, the monumental temple built by the emperor Hadrian in honour of many gods. Head to the Vatican Museums and let your guide bring the works of art to life at the Pinecone Courtyard, the Hall of Maps, the Gallery of Tapestries, and the Gallery of Candelabra. You'll learn about the figures responsible for these works and their history along the way. 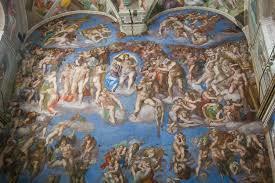 Later, visit the magnificent Sistine Chapel. Take some time inside the world famous room to pick out the details you hear about – Michelangelo’s self-portrait, for example, in which he expresses to the world that he would rather be skinned alive than paint in the Sistine Chapel again. - Ticket for Musei Vaticani and Cappella Sistina.